No oxidation resistance. Vacuum, hydrogen or inert atmospheres. Highest output of base metal thermocouples. Not subject to corrosion at cryogenic temperatures. Reducing atmosphere recommended. Iron leg subject to oxidation at elevated temperatures--use larger gauge to compensate. Well suited for oxidizing atmospheres. For general use, better resistance to oxidation and sulfur than Type K.
Oxidizing atmosphere recommended. Easily contaminated, require protection. Laboratory standard, highly reproducible. Easily contaminated, require protection. Most stable at cryogenic temperatures ranges. Excellent in oxidizing and reducing atmospheres within temperature range. The Type E thermocouple is suitable for use at temperatures up to 900°C (1650°F) in a vacuum, inert, mildly oxidizing or reducing atmosphere. At cryogenic temperatures, the thermocouple is not subject to corrosion. This thermocouple has the highest EMF output per degree of all the commonly used thermocouples. The Type J may be used, exposed or unexposed, where there is a deficiency of free oxygen. For cleanliness and longer life, a protecting tube is recommended. Since JP (iron) wire will oxidize rapidly at temperatures over 540°C (1000°F), it is recommended that larger gauge wires be used to compensate. Maximum recommended operating temperature is 760°C (1400°F). Due to its reliability and accuracy, Type K is used extensively at temperatures up to 1260°C (2300°F). It's good practice to protect this type of thermocouple with a suitable metal or ceramic protecting tube, especially in reducing atmospheres. In oxidizing atmospheres, such as electric furnaces, tube protection is not always necessary when other conditions are suitable; however, it is recommended for cleanliness and general mechanical protection. Type K will generally outlast Type J because the JP (iron) wire rapidly oxidizes, especially at higher temperatures. This nickel-based thermocouple alloy is used primarily at high temperatures up to 1260°C (2300°F). While not a direct replacement for Type K, Type N provides better resistance to oxidation at high temperatures and longer life in applications where sulfur is present. This thermocouple can be used in either oxidizing or reducing atmospheres, though for longer life a protecting tube is recommended. Because of its stability at lower temperatures, this is a superior thermocouple for a wide variety of applications in low and cryogenic temperatures. It's recommended operating range is— -200° to 350°C (-330° to 660°F), but it can be used to -269°C (-452°F) (boiling helium). Maximum recommended operating temperature for Type S or R is 1450°C (2640°F); Type B is recommended for use at as high as 1700°C (3100°F). These thermocouples are easily contaminated. Reducing atmospheres are particularly damaging to the calibration. Noble metal thermocouples should always be protected with a gas-tight ceramic tube, a secondary tube of alumina and a silicon carbide or metal outer tube as conditions require. This refractory metal thermocouple may be used at temperatures up to 2315°C (4200°F). Because it has no resistance to oxidation, its use is restricted to vacuum, hydrogen or inert atmospheres. 1. Where tolerances are given in percent, the percentage applies to the temperature being measured in degrees Celsius. For example, the standard tolerance of Type J over the temperature range 277 to 750ºC is ± 0.75 percent. If the temperature being measured is 538ºC, the tolerance is ± 0.75 percent of 538ºC, or ± 4.0ºC. To determine the tolerance in degrees Fahrenheit, multiply the tolerance in degrees Celsius times 1.8. 2. Copper versus copper compensating extension wire, usable to 100ºC (212ºF) with maximum deviations as indicated, but with no significant deviation over 32 to 0 to 50ºC (122ºF) range. Matched proprietary alloy compensating wire is available for use over the range 0 to 200ºC (32 to 392ºF) with tolerances of ±0.033 mV (±3.7ºC5). 3. Not an ANSI symbol. 4. Copper (+) versus copper nickel alloy (-). 6. Thermocouples and thermocouple material are normally supplied to meet the tolerances specified in the table for the normal specified range. The same materials, however, may not fall within the cryogenic tolerances in the second section of the table. If materials are required to meet the cryogenic tolerances, the purchase order must so state. Selection of materials usually will be required. Tolerances indicated in this table are not necessarily an indication of the accuracy of temperature measurements in use after initial heating of the materials. The total heat energy (kWh or Btu) required to satisfy the system needs will be either of the two values shown below depending on which calculated result is larger. The power required (kW) will be the heat energy value (kWh) divided by the required start-up or working cycle time. The kW rating of the heater will be the greater of these values plus a safety factor. The calculation of start-up and operating requirements consist of several distinct parts that are best handled separately. However, a short method can also be used for a quick estimate of heat energy required. Safety Factor is normally 10% to 35% based on application. A = Watts required to raise the temperature of material and equipment to the operating point, within the time desired. B = Watts required to raise temperature of the material during the working cycle. C = Watts required to melt or vaporize material during start-up period. D = Watts required to melt or vaporize material during working cycle. You should always include a safety factor of varying size to allow for unknown or unexpected conditions. 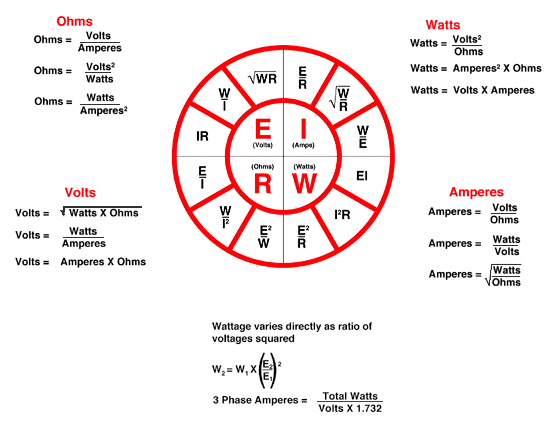 The size of the safety factor is dependent on the accuracy of the wattage calculation. Heaters should always be sized for a higher value than the calculated figure. A factor of 10% is adequate for small systems that are closely calculated; 20% additional wattage is more common. Safety factors of 20% and 35% are not uncommon, and should be considered for large systems, such as those containing doorsthat open or are large radiant heat applications. You'll also want to predict how long your system will operate without failure, so examine the amount of heater life you'll be needing. And because electricity costs money, take efficiency factors into account so your system will cost as little as possible to operate. With these considerations in mind, carefully review them all to be sure you do, in fact, have definitive information to decide on a particular solution to your heating problem. Some of this supporting information may not be readily available or apparent to you. You may find it necessary to consult the reference tables and charts in this reference data section, or reference a book that deals with the particular parameter you need to define. At the minimum, the thermal properties of both the material(s) being processed/heated and their containing vessel(s) will be required. Figuring a safety factor requires some intuition on your part. The list of possible influences can be great. From changing ambient operating temperatures, caused by seasonal changes, to a change in material or material temperature being processed, you must carefully examine all the influences. Generally speaking, the smaller the system with fewer variables and outside influences---the smaller the safety factor. Conversely, the larger the system and the greater the variables and outside influences — the greater the safety factor. The safety factor should be higher for systems that have production operations that contain equipment cycles subjecting them to excessive heat dissipations, e.g. : opening doors on furnaces, introducing new batches of material that can be of varying temperatures, large radiant applications and the like. Heat Losses at 70°F Ambient. 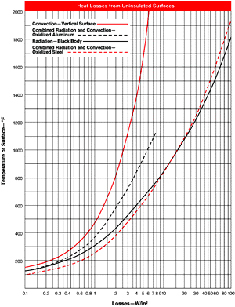 The radiation curve shows losses from a perfect blackbody and are not dependent upon position. Commonly used block materials lose less heat by radiation than a blackbody, so correction factors are applied. These corrections are the emissivity (e) values. 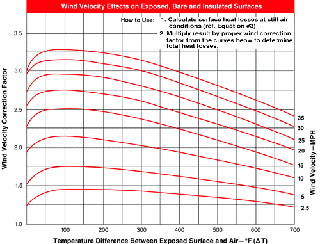 The graphs for losses from uninsulated and insulated surfaces are hard to read at low temperatures close to ambient. Here are two easy-to-use calculations that are only rule-of-thumb approximations, but they are reasonably accurate when used within the limits noted. 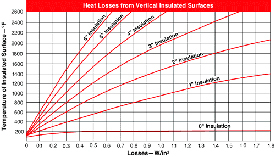 Losses from an uninsulated surface (with an emissivity close to 1.0): (This applies only to temperatures between ambient and about 250ºF). 1. Based upon combined natural convection and radiation losses into 70ºF environment. k = 0.83 @ 1000ºF. 3. 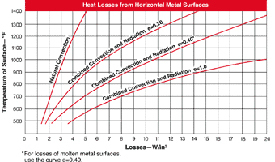 For molded ceramic fiber products and packed or tightly packed insulation, losses will be lower than values shown. Therm-x of California is committed to supplying our customers with quality products and superior customer service. We empower our employees to participate in the continuous improvement of our quality management system through team participation and company wide initiatives. © 2019 THERM-X. All Rights Reserved.